BRANCHBURG, N.J. (AP) — The ouster of Tom Price as President Donald Trump’s health secretary is yet another self-inflicted blow for Republicans wishing to put their own stamp on health care — and the latest distraction for a White House struggling to advance its agenda after months of turmoil. Price resigned Sept. 29 amid investigations into his use of costly charter flights for official travel at taxpayer expense. His exit makes it even more unlikely that Republicans will be able to deliver on their promise to repeal and replace former President Barack Obama’s law, even though they control the White House and both chambers of Congress. “I think health care is a dead letter through the next election,” Joe Antos, a policy expert with the business-oriented American Enterprise Institute, said Sept. 30. The health secretary’s exit capped a week in which a last-ditch GOP health care bill failed to advance in the Senate. Regaining momentum will be more difficult now that the White House also has to find a replacement for Price. 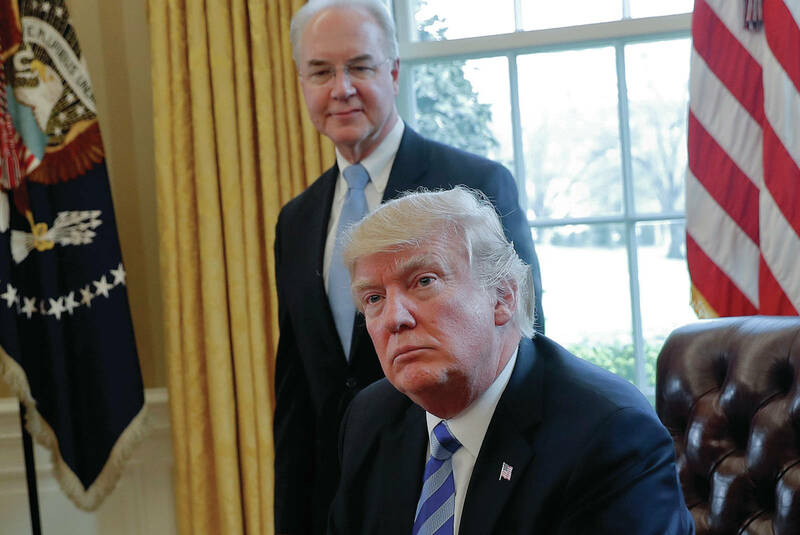 That makes it harder to visualize how the administration and congressional Republicans can fulfill their goal of remaking the health care system along conservative lines, although Trump has said he’s confident a plan can pass early next year. The health secretary’s departure — the latest in a list that now includes Trump’s chief of staff, national security adviser, press secretary and two communications directors — is also unlikely to end what has been a steady drip of revelations about potentially inappropriate travel on the part of Cabinet members. Treasury Secretary Steven Mnuchin has come under fire for requesting a government aircraft to use on his honeymoon, while Interior Secretary Ryan Zinke said he’d taken three charter flights while in office, including a $12,375 late-night trip from Las Vegas to his home state of Montana in June. The Environmental Protection Agency’s inspector general has opened an inquiry into Administrator Scott Pruitt’s frequent taxpayer-funded travel on commercial planes. The House Oversight and Government Reform committee has launched a government-wide investigation of top political appointees’ travel. Trump ran on a pledge to “drain the swamp” in Washington and has taken pride in his efforts to reduce federal spending and negotiate better deals on behalf of American taxpayers. In a Sept. 29 memo, White House budget director Mick Mulvaney said all travel on government-owned, rented, leased or chartered aircraft will now have to be approved by the president’s Chief of Staff John Kelly. That gives more oversight power to a man who has tried to impose order and structure on what has been a chaotic White House. On health care, the task of installing another secretary at the Health and Human Services department won’t be easy. The nominee will have to run the gauntlet of Senate confirmation. The already contentious process will be more challenging as Democrats shift from playing defense to offense on health care, heartened by the survival of the Affordable Care Act and polls showing support for the government’s leading role in health care. Verma is a protege of Pence, who played a major role in negotiations with Congress this year on the futile “Obamacare” repeal effort. Verma is seen as a talented policy expert, but she’s still relatively new to the ways of Washington. Gottlieb is a veteran, but he may prefer the FDA and its clearly defined mission to the quicksand of health care policy. Another potential candidate is Florida’s Republican Gov. Rick Scott, a former hospital executive who is term-limited after 2018. But Scott is expected to mount a Senate campaign against Democratic incumbent Sen. Bill Nelson next year, and he may have ambitions and interests beyond health care. Alonso-Zaldivar reported from Washington. Associated Press writers Jonathan Lemire in New York and Catherine Lucey in Washington contributed to this report.